The Masseria Don Cirillo, located in the south of Salento, is embedded in the uncontaminated nature, with beautiful olive trees and the typical Mediterranean vegetation, which grows luxuriant close to the beach and almost touches the sea. The distance to the see and to Torre San Giovanni Marina is approximately 3 km away. 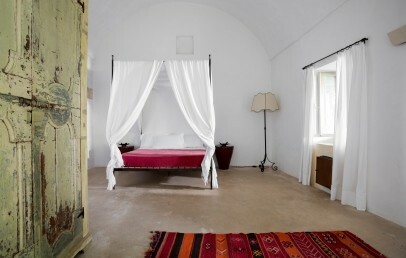 Masseria Don Cirillo has the pleasant and relaxing atmosphere, that only a hotel in the countryside can offer. Among oak forests, fig trees, the masseria stands out with its whiteness, with its lovely swimming pool set among the rocks and welcomes its guests in simply but very elegantly furnished rooms. The nearest airport is Brindisi Casale and the Masseria can be reached by driving on the road Lecce - Gallipoli - Santa Maria di Leuca. The beach of Torre San Giovanni is located a few kilometres away from the Masseria. 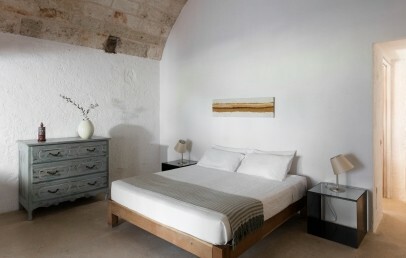 Rooms are protected by thick white lime walls, which keep the rooms cool and quiet; rooms are designed to offer the maximum comfort (air conditioning, TV and mini-fridge), but the style is simple, characterised by the presence of fine luxury, as the pieces of furniture, some of which are handmade antiques by skilful craftsmen, made of natural fabrics. 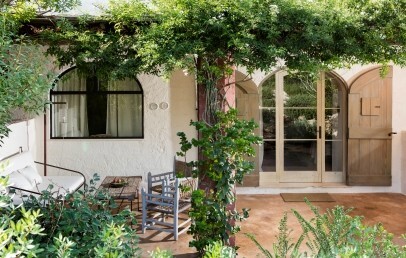 Each room is equipped with a terrace and offers a nice garden view; the garden is colourful and scented with lavender, thyme, rosemary and mint. In order to ensure the maximum relaxation to all guests, no room has a telephone. Superior – (approx. 20-25 sqm) are comfortable rooms on the first floor or the ground floor, with balcony or veranda equipped with chairs and table, allowing guests to enjoy the beauty of the surrounding landscape. Deluxe – (approx. 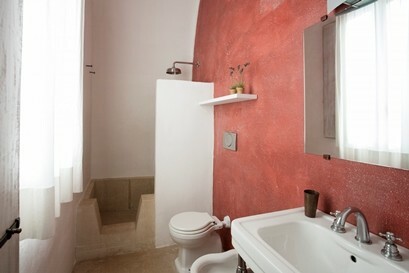 25-30 sqm) the rooms are equipped with some special features, such as the bathroom with two showers. Prices include accommodation, continental breakfast, daily cleaning and change of bed linen/towels twice a week. An extra charge is due for extra linen change of € 10 and for customized breakfast (gluten-free, vegan, regional products, vegetables km 0) € 10 per person/breakfast. Baby coat for the the child up to 3 y.o. to be paid locally: € 10,00 per day. Mountain bikes are at guests' disposal and can be used to reach the beaches and visit the beautiful surroundings of the Masseria (upon availability). City tax – € 0,50 per person/overnight for a maximum of 7 overnights (excluding children under 12 years and not self-sufficient disabled people) to be paid on spot. The taxe is required from June 15th to September 15th. Important – The reception is open from 9:00 AM to 8:30 PM. Check-in time is from 2.30 PM. Therefore it is necessary to provide your arrival time at least one day in advance. Comfortable rooms, on first and ground floor. 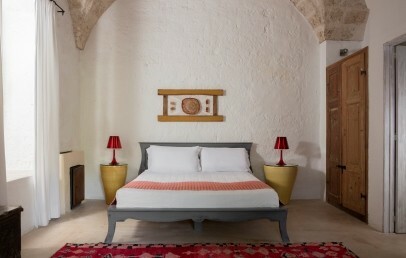 White plastered walls, natural fabrics and custom furniture either local antiquities or masterfully handcrafted, make your holiday a unique and suggestive experience. Each room has a small terrace with armchairs and table, to allow the guests to enjoy the beauty of the surrounding landscape and the view on the garden, rich with lavender, rosemary and mint. No telephone. Ample rooms on first and ground floor. 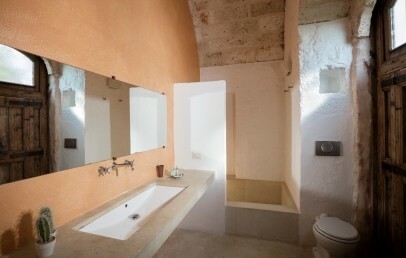 White plastered walls, natural fabrics and custom furniture either local antiquities or masterfully handcrafted, make the stay a unique and suggestive experience. Each room has a small terrace with armchairs and table, to allow the guests to enjoy the beauty of the surrounding landscape and the view on the garden, rich with lavender, rosemary and mint. The bathroom has double shower. No telephone.